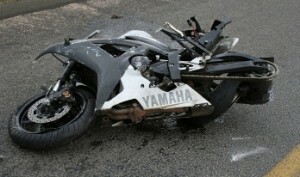 This freedom has a price, however, since motorcyclists confront more hazards on the road than any automobile ever could. Direct exposure to the elements and lack of protection in a collision often turn a motorcycle accident into a life or death situation for the rider. Sadly, those are just the first two entries on a long list of potential threats motorcyclists must overcome to get to their destinations safely each time they hit the road. Drivers who fail to look for motorcyclists are a constant danger. Navigating poorly maintained roads is particularly challenging on a motorcycle while drivers might not even notice. A deer crossing the road suddenly may place a driver in danger, but for a rider, a collision with an animal that size could very well be fatal. Even something like rainy streets can be life threatening when you’re only on two wheels, completely exposed. Unfortunately, even the best riders can be overwhelmed by the risks involved while riding a motorcycle. As exposed as riders are, they are particularly vulnerable to catastrophic injuries or even death from any type of roadway incident. This additional risk makes it imperative those motorcyclists anticipate perilous situations even before they happen and that they’re fully prepared to make emergency, evasive maneuvers in an instant. Another obstacle motorcycle accident victims must overcome is the common perception that they’re all reckless and rebellious nuisances on the road. This reputation means liability will certainly be contested and the rider will be assumed to have been the cause of the accident. Since any rider recovering from a roadway accident is likely to have significant injuries and medical concerns to manage, a drawn out battle over liability can bring on financial burdens that quickly overwhelm victims. Worse yet, recent studies show that more often than not, vehicular accidents are not the fault of the motorcyclist. A recent study done on Florida motorcycle accidents reviewed 10 years worth of crash data involving motorcyclists and found that the riders were only at fault in 40% of all the crashes in which they were involved. Seasoned riders claim drivers often don’t even look for motorcycles and are quick to point out that distracted drivers are getting worse thanks to increased smart phone usage by automobile drivers. At Martin & Lerda Attorneys for the Injured, we fully support the rights of motorcycle riders in the Pittsburgh, PA region. Our law firm is dedicated to holding negligent parties accountable for the anguish and pain they impose on innocent victims through their reckless actions. Compensation factors that may be applicable to your claim include loss of wages, from time missed at work, medical expenses, the pain endured in recovery, emotional suffering and future expenses directly related to the crash. If you’re suffering any of these challenges after your accident we can help, you deserve to have your interests protected. Our experience defending previous motorcycle crash victims combined with our expertise in personal injury defense strategies makes us uniquely qualified to help motorcycle accident victims get the settlement they legally deserve. If you were involved in an accident while riding a motorcycle in the greater Pittsburgh area, call us today and set up a free consultation to discuss the details unique to your accident. We’ll take that information and create a strategic defense that will protect your rights, get you the compensation you justly deserve all while holding the parties at fault fully accountable for their misdeeds. In an instant, an enjoyable motorcycle ride can turn into a serious or fatal accident. If you choose Martin and Lerda as you legal counsel our firm’s experienced accident attorneys will have one, and only one priority: get you the settlement package you’ll need to fully recover from the aftermath of the accident and move forward with your life as it was before. If you have been injured in a motorcycle accident in the Pittsburgh, PA area you should consult an attorney about compensation you may be due. Contact Martin & Lerda today for a free consultation at (412) 271-6800. We offer flexible scheduling times to accommodate your needs.